Justin Bieber has finally met his match. And it's not Selena Gomez. The fateful meeting did take place in Hollywood however. Where else? JB reportedly chatted with his new friend's manager, and he later described their meeting as "very cool." His chum didn't say much though. Apparently, he's the strong, silent type. Yes, "he." To reiterate, it's not Selena Gomez. Okay? Okay. The Biebs' match is his new wax figure at Mme. Tussaud's in Hollywood. Of course, Justin Bieber has other paraffin likenesses in various museums all over the globe, but sadly, they all share the same problem. They don't look like him. The one in Brazil's Dreamland Museum is the absolute spitting image...of Cody Simpson. 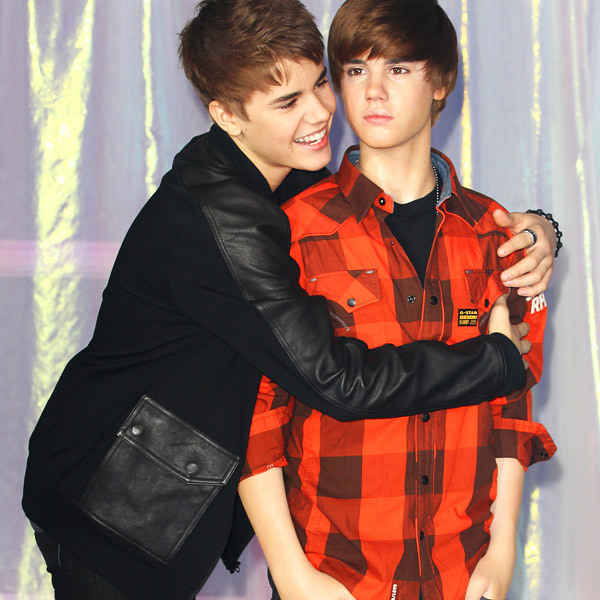 And the Madrid Wax Museum's JB is just plain ugly. Sadly, the waxy Biebs on display at various Mme. Tussauds aren't much better. The New York Biebs is a fair likeness but he's a tad too short and he looks downright scared of waxy Selena Gomez who towers over him. In all fairness, the Selena Gomez statue doesn't really look much like the Who Says? singer either. And whoever crafted Las Vegas Biebs definitely did not hit the jackpot. Madame Tussaud's in Hollywood finally got it right however. Even though the statue is not yet finished, the resemblance is remarkable. As you can see by clicking here, the Hollywood statue head's features are a spot on match. Very cool, indeed. It will be an exact wax replica of Justin when it's finished. Imagine. A Justin Bieber wax figure that actually looks like him. What a concept. Note: If you've clicked on the photo and you're having trouble distinguishing which Biebs is real, the statue head is the extremely pale one on the left.